There’s a phrase, “Beware of Greeks bearing gifts”, that needs an update. It should now read, “Beware of French movie directors making vanity projects”. A project that’s been on his mind to make since The Fifth Element (1997), Luc Besson’s Valerian and the City of a Thousand Planets arrives trailing a cosmos-worth of hype and anticipation, but somehow manages to land with a massive, resounding thud. This is a movie that looks continuously busy, but at the same time it feels like it’s leaden and ponderous. It’s another loud barrage of a sci-fi movie driven by mounds of uninteresting exposition, and supported by empty visuals that look amazing but offer as much refreshment as an empty bottle of water. It’s a mess, and one that never lets up in its efforts to impress you with its meticulously detailed sets and costumes, and its tired characterisations. There’s a love story too, between two charismatic military operatives, Valerian (DeHaan) and Laureline (Delevingne), that offers occasional and all too brief periods of respite from the CGI onslaught, and which feels as organic as the pixelated backgrounds it plays in front of. And there’s a villain, one so obvious that they might as well stomp around yelling, “I’m the bad guy!” (in case the viewer isn’t sure). There’s more, lots more, lots and lots and lots of it, with Besson aiming to include a veritable kitchen sink’s worth of alien species, high-tech weaponry, dazzling backdrops, vibrant colours, impressive make up designs, and specious action scenes. There’s a story in there too – somewhere – but it’s overwhelmed by the movie’s need to keep moving from one breakneck-paced scene to another. 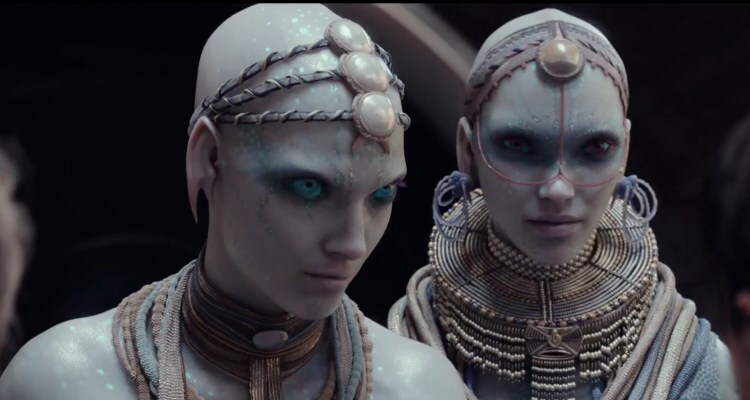 There are long stretches where the viewer might find themselves wondering if they’ve transitioned into watching the video game version of Valerian… and other stretches where they might also be wondering if Besson actually knows what’s supposed to happen next. Too often, things happen for no better reason than that Besson wants them to, and the pacing seems relentless, as the writer/director flings his lead characters into danger after danger, but without once actually putting them in danger. The cast suffer almost as often and as much as the viewer. As the titular hero, DeHaan tackles the role with enthusiasm and a fair degree of commitment, but is hampered by Besson’s decision to make Valerian look and sound like a high school kid on his first day at an entry-level job. DeHaan is a talented actor but fantasy sci-fi is not his forte, and he rarely seems comfortable with all the running and leaping about and firing guns. Delevingne, meanwhile, appears to be far more in tune with Besson’s ambitions for the movie, and her knowing, unimpressed demeanour works well for the character, and acts as a subtle commentary on the movie as a whole. But too often, Laureline has to play second fiddle to Valerian, an unhappy circumstance that gives rise to the idea that in the 28th century, sexism still hasn’t been consigned to the dustbin of history. There’s a great supporting cast, too, used to occasional good effect, but too often required to stand around waiting for the next clunking shift in the storyline to get them moving again. Owen’s character is an angry clown in a self-consciously big hat, Rihanna is a shapeshifting cabaret artist whose admittedly enjoyable stage routine still stops the movie dead in its tracks, Hawke (as Jolly the Pimp no less!) seems to be acting in another movie altogether, while Hauer gets off lightly with a Presidential address at the start of the movie that has all the hallmarks of being a favour to the director. Only Spruell as an harassed general seems to have grasped Besson’s intentions for his character, and as a result, his appearances are a godsend. In case you’re wondering if there’s anything remotely good about Valerian and the City of a Thousand Planets, then rest assured there is, but unfortunately it’s all packed into the first fifteen to twenty minutes. Here we see the International Space Station grow in size as several countries from Earth send representatives in space vehicles that attach themselves to the station. As time goes by, alien life-forms also visit the station, and the same welcoming rituals are observed: a handshake, a bemused smile/grimace from the human in charge, and a succession of impressively realised aliens who seemed equally bemused by the idea of said handshake. As more and more ships arrive and attach themselves, the space station becomes – ta-da! – Alpha, the city of a thousand planets. It’s a terrific idea, well executed, and bodes well for the rest of the movie. Things look even better when the narrative shifts to the planet Mül, and we’re introduced to the race that live there, a peaceful, pearl-cultivating civilisation that becomes central to the plot later on (as expected), and which is apparently wiped out by events happening nearby in space. But with that prologue out of the way, we’re thrust thirty years on and forced to put up with the romantic aspirations of Valerian, and the machinations of a plot that serves as a second cousin retread of Besson’s earlier work on The Fifth Element (watch that movie now and you’ll see how inter-connected they are). When a director announces that they’re finally going to make a long-cherished project, and one that they’ve delayed making due to the limitations of existing technology, it should be a cause for celebration. After all, it wouldn’t be wrong to believe that as they have such a passion for the project, that they’d make every effort to ensure the finished product was a vast cut above their other movies, the pinnacle of their career perhaps. But somewhere along the way, Besson has settled for making a movie that is plodding and uninspired. Scenes and characters come and go without making the slightest impact, and Besson makes the same basic error that so many other fantasy/sci-fi directors make: they mistake a distinct visual style for substance. This leaves Valerian… feeling like it’s only half the movie Besson envisaged, and with a generic genre score by the usually reliable Alexandre Desplat to add to the misery, this is a strong contender for Most Disappointing Movie of 2017. 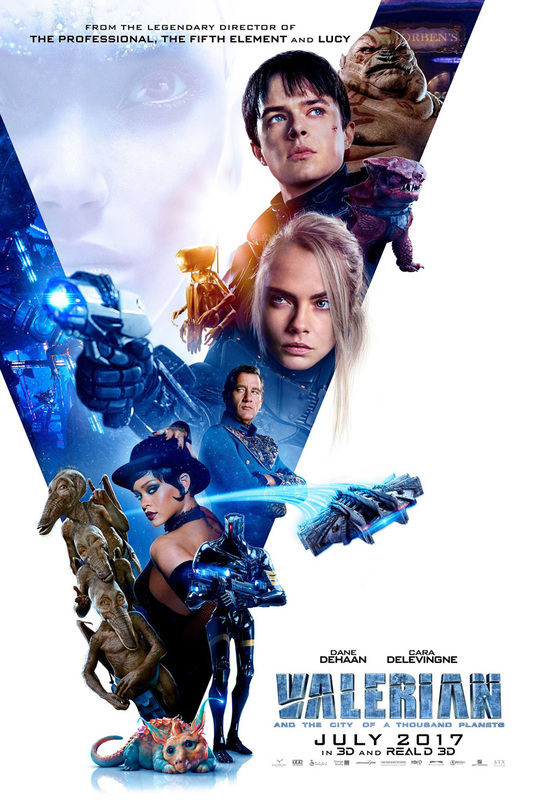 Rating: 4/10 – technical wizardry aside, Valerian and the City of a Thousand Planets is an unabashed dud, content to make as little effort as possible, and trading on its writer/director’s past glories; with its €197 million budget making it the most expensive European and independent movie ever made, it’s a shame that all that money has been used to such undemanding and underwhelming effect.